I designed these French Hen egg cosies to make an entry for a Flickr photo contest on the theme of the “12 Days of Christmas”. You’ll find the instructions below. They are great for using up oddments of yarn. PLEASE NOTE these instructions use British crochet terms. This is a good project for a beginner who already knows how to work chain, double crochet and treble. The cosy is worked in rounds from the top of the head. 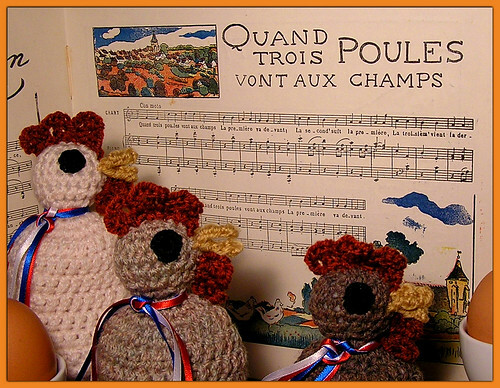 The head and upper body are worked in double crochet (dc) (American: single crochet). The skirt part is worked in trebles (tr) (American: double crochet). The lower edge is trimmed with reverse double crochet (reverse sc, also known as crab stitch) The work is not turned between rounds, and the side facing you as you stitch will be the outside of the finished cosy. Other abbreviations: ch = chain, dec = decrease, R = round, ss = slip stitch, st = stitch. How to increase: work two stitches into the same stitch of the previous round. How to decrease 1 dc: insert hook in next st, yarn over hook, pull through a loop (as if making a normal dc), leave the two loops on the hook, insert hook in following st, yarn over hook, pull through a loop. You now have three loops on the hook. Yarn over hook and pull through all three loops. How to work reverse dc: work in dc, but instead of working in the normal direction (right to left if you work right-handed) you start with the last stitch of the previous round and work backwards towards the first stitch (ie left to right if you work right-handed). The stitches will form a little peaked edging rather than the usual chained top. It takes practice to keep the stitch even, but it is a useful edge stitch, worth learning. However, if you wish, this round can be omitted. Acrylic DK (knitting worsted weight) yarn in three colours. Approx 15g brown (or other suitable colour) for the head and body, a small quantity of red for the comb and waffle, a very small quantity of yellow for the beak. Scrap of black embroidery floss to make eyes (or two small black buttons and sewing thread and needle to attach them). Very small amount of soft toy filling to stuff the head. Ribbon for trimming the neck, if required. Yarn needle and scissors for making up the cosy. 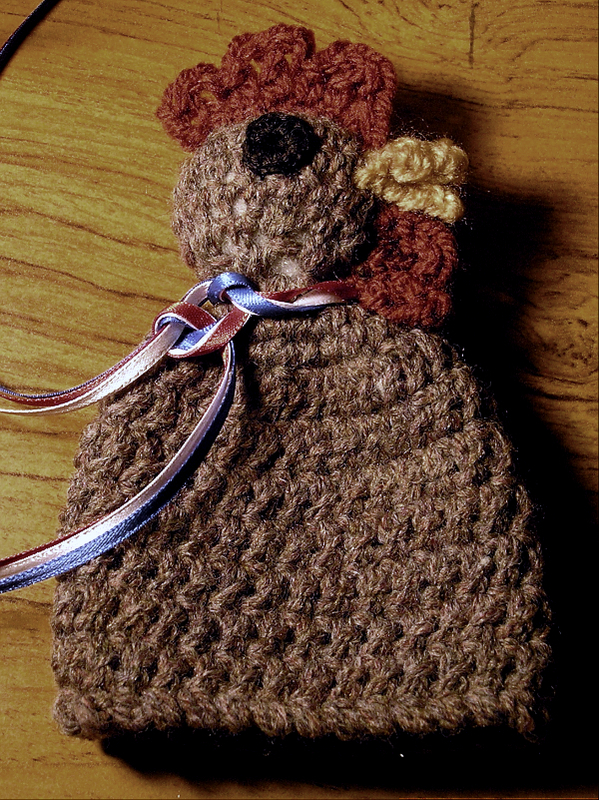 With brown yarn, make 2 ch. Work 6 dc into the second ch from hook. Join to a round with a ss into the 1st dc. 1 ch, work 2dc into each st of R1, join to a round with a ss into the 1st dc. 1ch, 1dc into first st of R2, 2 dc into next st, repeat alternately 1 dc, 2 dc, to end of round – you should have 18 dc in total – join with a ss into the 1st dc. 1 ch, 1 dc into 1st and every subsequent st of previous row. Join with ss into 1st dc. The head should now be looking like a cup. 1ch, 1 dc, dec 1 dc in next two sts, repeat alternately 1 dc, dec 1 dc, to end of round – you should have 12 stitches in total. Join a ss into the 1st dc. Now take a small amount of filling and stuff the head. Use enough to give it a good shape, but do not stuff it so tightly that the stitches stretch out of shape. 1 ch, dec 1 dc in the 1st 2 sts of R6, and every 2 sts to end of round. Join with a ss into 1st dc. 1 ch, continue in dc increasing 1 dc in every 3rd st of R9 – you should have 24 sts. Join with a ss into 1st dc. At this point the stitching changes from dc to trebles. While working in dc, the starting chain in each round did not count as a stitch. From this point the 2 starting chain count as the first stitch of the row. 2 ch (counts as 1st tr), continue in tr, increasing 1 tr in every 4th st of R10 – you should have 30 sts. Join with a ss into 2nd of the 2 ch. Continue in tr, replacing 1st tr with 2 ch and joining each R with a ss into the 2nd of the 2 ch. 1 ch, work reverse dc, working backwards from the last st of the previous row. (See ‘How to’ section, above.) Finish off yarn, leaving a tail for darning in. Darn in ends, using yarn needle, and cut off surplus. Flip up the skirt of the cosy and work a few darning stitches across the inside of the neck opening, to prevent the filling coming out of the head. Using yellow yarn, make 8 ch. Work 1 dc in 3rd ch from hook, 1 tr in each of next 3 ch, 1 dc in 7th and a ss in 8th. finish off yarn, leaving a long end for sewing to head. Darn in starting yarn, using yarn needle and cut off surplus. Darn finishing yarn through stitches to centre of beak. Fold beak in half, points together, and stitch the central treble securely to front side of head, as shown in the picture. Using red yarn, make 10 starting ch. Work 1 tr in 4th ch from hook, 2 ch, 1 dc in 5th starting ch, 2 ch, 1 tr in 6th starting ch, 2 ch, 1 dc in 7th starting ch, 2 ch, 1 tr in 8th starting ch, 2 ch, 1 dc in 9th starting ch, ss into 10th starting ch. Finish off, leaving a long end for sewing to head. Darn in starting yarn. Use finishing yarn to attach the starting chain of the comb from above the beak, over the crown of the head. Using red yarn, work 6 starting chain. Work 1 tr in 4th starting ch, 2 ch, 1 dc in 5th starting ch, 4 ch, 1 dc in 5th starting ch, ss into 6th starting ch. Finish off, leaving long end for sewing to head. Darn in starting yarn. Attach the starting chain of the wattle to the front of the head, between the beak and the neck, gathering it slightly. Your egg cosy is now complete. If you wish, you can trim the neck of the hen with brightly coloured ribbon. If a young child might play with the cosy, make sure any ribbons or trims are securely attached. Designed by Sue Jones, December 2009.